A few days ago, I wrote about an afternoon cookie craving leading us to Sant Ambroeus in the West Village (where we got excellent service). This post is about Sant Ambroeus on the Upper East Side, where I met a friend for lunch and enjoyed the food, but experienced pretty bad service. This is not the first time I went to Sant Ambroeus for lunch, but this was the first time, I was successful in getting a table there for lunch. You can get coffee at the bar in front, or get pastries to go, but its tough to get a table at the front of the restaurant by the huge floor to ceiling windows. This time I made a reservation for lunch, and so was guaranteed a table. It took a few minutes for the hostess to acknowledge our presence – she just walked past us a few times as she was setting another table. The hostess looks at us without even as much as a “Hi”, says that there is no table available, clearly assuming that we were walk-in guests. When I mentioned my name and the reservation, there was no apology, but we got seated at a table right away. At the table, there was only one menu, but we were ok with that. It was barely a minute that we were seated, when the server came to ask us if we knew what we want to order (and we had only one menu just yet for the two of us), and as an after thought asked us if we wanted something to drink. My friend asked for a diet coke with no ice, and within a few minutes, we got a diet coke and a glass filled with ice! We were also served two pieces of bread on one quarter plate with a butter knife, but without butter. We did get butter, only after the food arrive though. The good news is that the food arrived very quickly. After our meal, my friend asked for a passion fruit tea, and she was served a mint tea. To be fair to them, I had asked for a mint tea, and changed my mind and asked for a chamomile tea and my friend was served the mint tea that I had originally ordered. The server did replace the mint tea with the passion fruit tea, but again, there was no apology. Now for the food, which was worth going there. 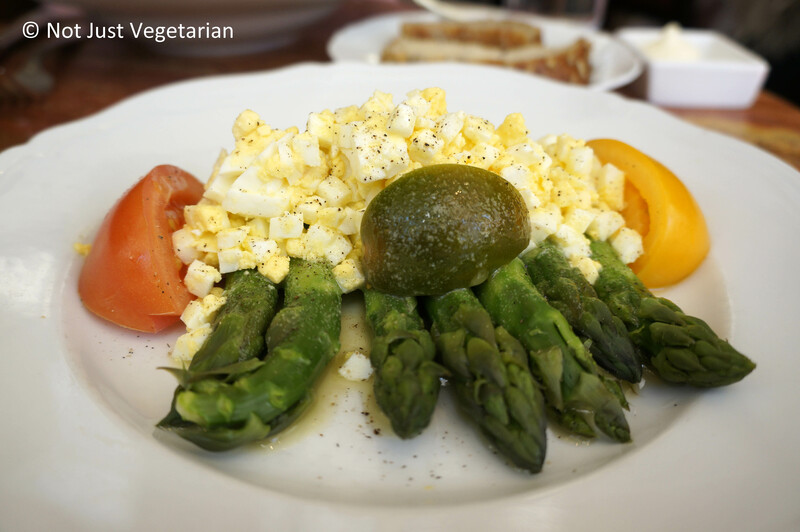 I was very keen to try a dessert there, so, I got the asparagus and egg salad, and my friend got the saffron risotto. I ordered the gianduia (a hazelnut dessert) and was extremely satisfied with my choice. 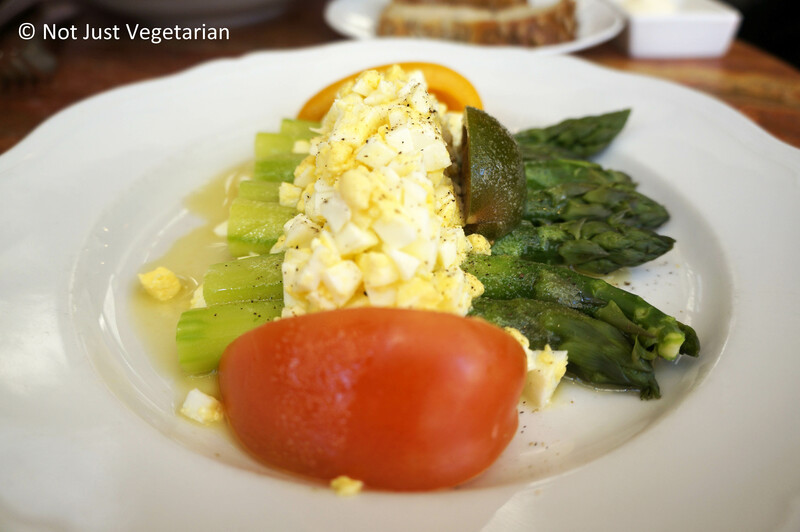 I loved the asparagus and egg salad. It was colder than I would like it to be served, but it was full of flavor, with a good balance of acidity from the lemon juice, along with olive oil, salt, and diced boiled eggs. The three different colored tomatoes were also delicious (usual red, yellow, and green). The diced eggs were the highlight of this dish – not dry at all, may be it was the olive oil, or the butter that was invisible to the naked eye. In any case, I would get this salad again. I liked the saffron risotto that my friend ordered. It was warm and a lovely bright yellow from the saffron in it. 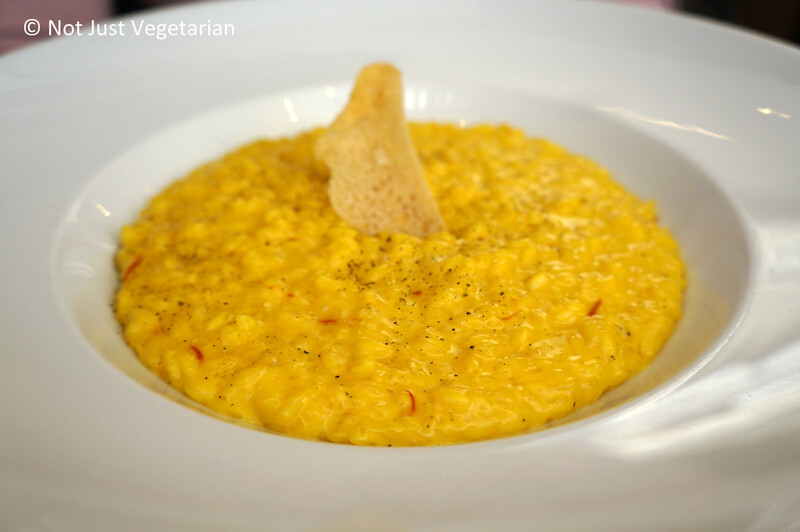 The risotto had several flecks of saffron strands peeking through the rice. The saffron flavor was distinct, yet mild without overwhelming the palate. I thought the risotto’s texture was excellent – with just enough of a bite in the rice, although my friend would have liked it softer. The best part of the meal was the gianduia. 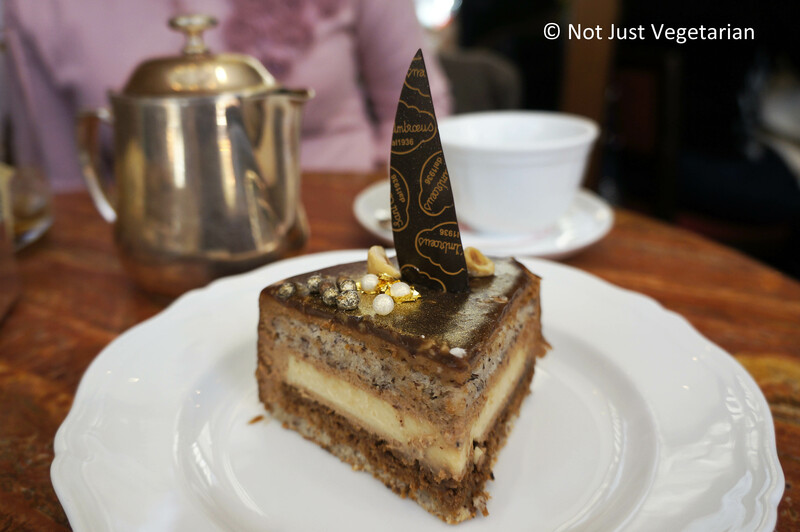 It was a hazelnut sponge cake, with hazelnut wafer, hazelnut mousse, and layers of hazelnut cream. I would have preferred a crispier hazelnut wafer, I suppose the cake was refrigerated and the wafer softened with the refrigeration. The dark chocolate on top was simply amazing – intensely chocolate-y and creamy. The spheres of gold / silver / white in front – did not taste great, more for its looks than its taste, kind of like rolled fondant. I am tempted to get this dessert again, but there are so many others that look equally delicious, that I must try some of the others. Overall, I would say, go to Sant Ambroeus for the food (although its expensive) and expect poor service / put up with it, you will be pleasantly surprised. The next time I go there, I might go just for sinfully delicious desserts or the sorbets / gelatos. Why would you go to Sant Ambroeus (Madison Avenue – Upper East Side)?